Located in the summer constellation of Cygnus, the North American Nebula (NGC 7000 at the middle left of this image) and the Pelican Nebula (IC 5070 on the right) form a complex of hydrogen emission nebulae located just a few degrees east of the first magnitude star Deneb. Filling over 10 square degrees of sky, the complex shines from the hot hydrogen gas that is energized by the new stars formed in the region. Each of the two nebulae contain a distinctive bright feature. 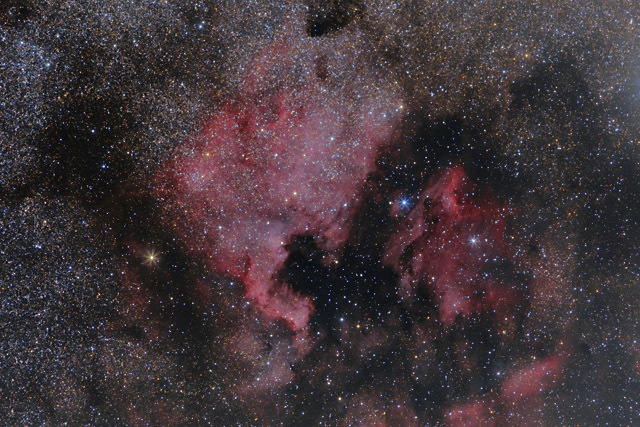 In the North American Nebula, the Cygnus Wall runs along "Baja California" within the North American. The Wall is very similar to the bright feature IC 5067 at the northern tip of the Pelican Nebula in that both of these areas contain intense star forming regions. These newly formed stars are shrouded in dust and also illuminate the surrounding nebula. In this image, North is up. This image is cropped to 80% of the original frame. Software Used Images Plus 5.5 for camera control, calibration, stacking, digital development, smoothing and noise reduction, multiresolution sharpening, and star size and halo reduction. Photoshop CS5 used for levels and curves, high pass filter, star shrinking, screen mask invert, lab color, selective color, hue adjustments, and unsharp mask. Gradient Xterminator for gradient removal. Registar for registration and stack alignment. Carboni Tools for additional noise reduction and smoothing. Notes This image was captured in order to complete the HaRGB version of this area. Although the nebulae look pretty good in this version, the combined Ha and RGB adds some beautiful extended nebulosity.